Here is our map of the area covered by Andy Weir’s 2011 novel, The Martian. The movie will be released on Oct 2, 2015. Take the map with you and follow the story cartographically. 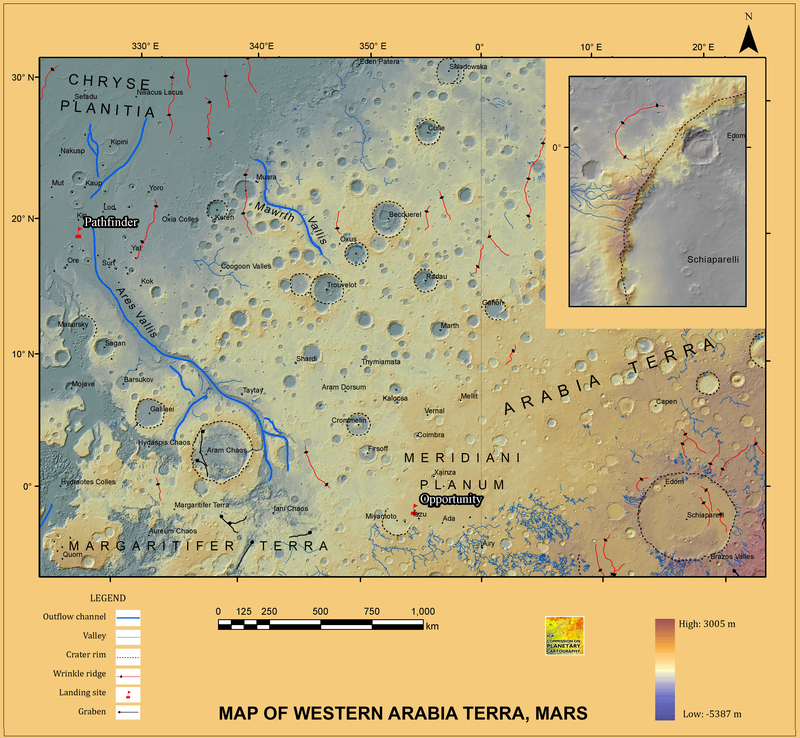 If you click on the link below this map, You’ll get fictional astronaut Mark Watney’s traverse on the real Martian terrain. Copyright notice: this map is in the public domain and is derived from public domain datasets. 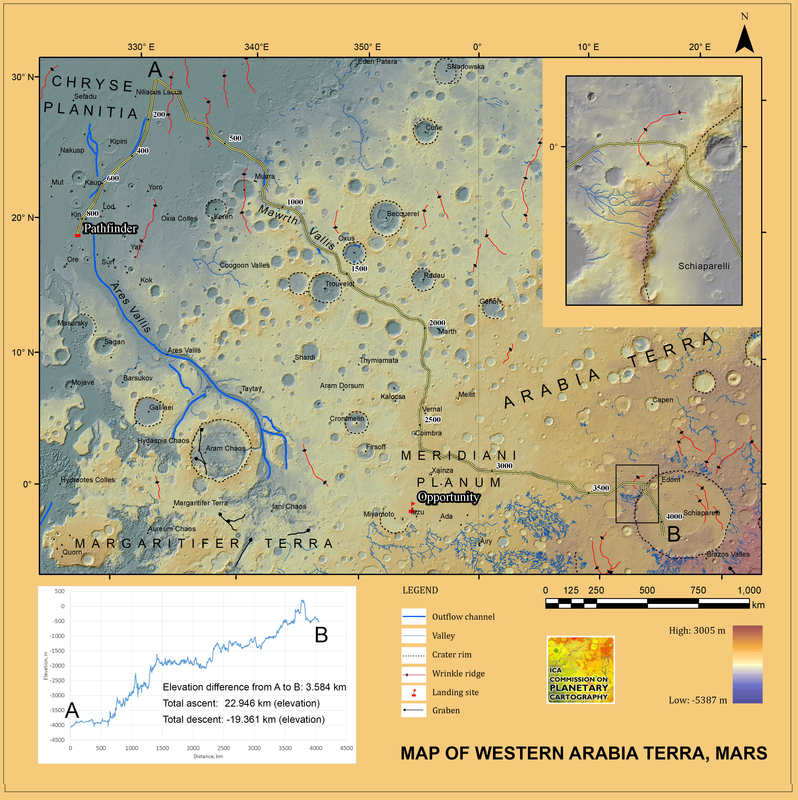 Geology: Tanaka, K.L., Skinner, J.A., Jr., Dohm, J.M., Irwin, R.P., III, Kolb, E.J., Fortezzo, C.M., Platz, T., Michael, G.G., and Hare, T.M., 2014, Geologic map of Mars: U.S. Geological Survey Scientific Investigations Map 3292, scale 1:20,000,000, pamphlet 43 p.,http://dx.doi.org/10.3133/sim3292. As part of our outreach activities, and in the framework of Map Year 2015-16, we have created a BuzzFeed article on planetary mapping. You can read it here. Map of Mars, in various projections. Illustration from the outreach article. The detailed history of planetary cartography in Russia (and the Soviet Union) is finally published in English. 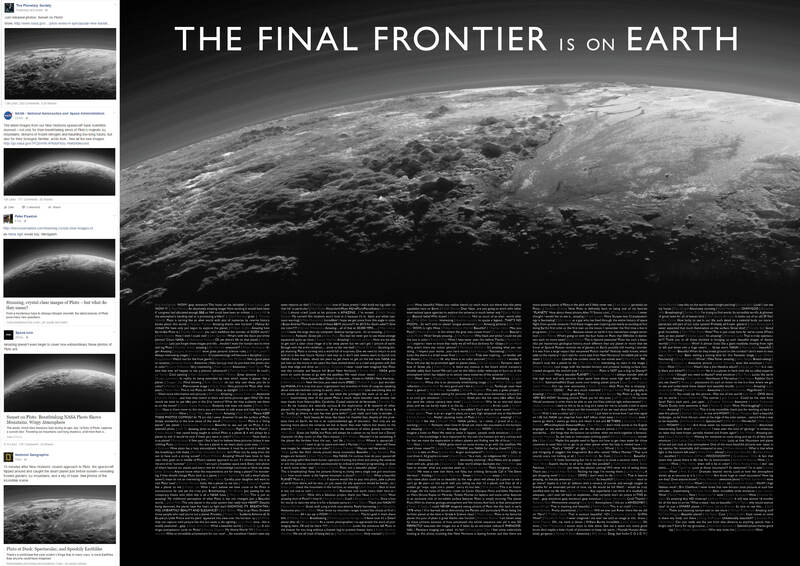 The book chapters cover maps, atlases and globes of the Moon, Mars, Phobos, Deimos and Venus, up to the latest planetary cartographic products, and separate chapters deal with the first maps of the lunar far side, and lunar toponymy. Vladislav Shevchenko, Zhanna Rodionova, Gregory Michael (2015): Lunar and Planetary Cartography in Russia. Springer.